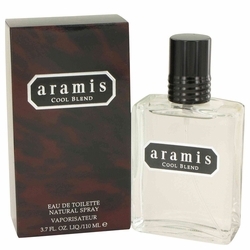 Aramis Cool Blend Cologne by Aramis. This aromatic spicy version of the classic fragrance is perfect for young men with an urban edge . Top notes include bergamot, lemon and lime. The floral-spicy heart of jasmine, sage, cinnamon and cardamom is contemporary and exciting. Rich base notes of golden amber, sandalwood and leather complete the composition.